The Catholic Daughters is the largest national organization of Catholic women in the world dedicated to strengthen their spiritual life through Christ and His Church. 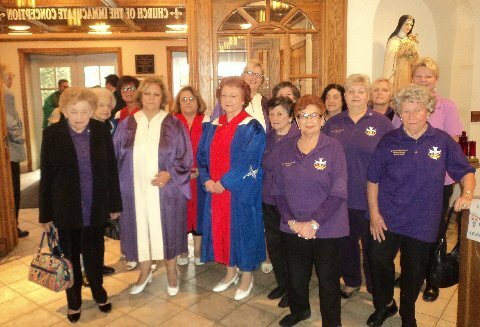 It was founded in 1903 by the Knights of Columbus and is organized in 42 states, and several island countries. The CDA strives to embrace the principles of faith, working through love in the promotion of justice, equality and the advancement of human rights and human dignity for all. Members are encouraged to develop leadership skills, dedication and great enthusiasm for the work of Christ and His Church. We are dedicated to our patroness, the Blessed Mother. Our motto is Unity and Charity. Our emblem – the Cross and Crown symbolize the reward promised to the faithful. We strive to be spirit-filled women who love, Christ, His Church, our country and all humanity.